"Cryotherapy is a long established treatment for various superficial skin lesions essentially using a very cold chemical, usually liquid nitrogen to selectively destroy the diseased part of the skin." 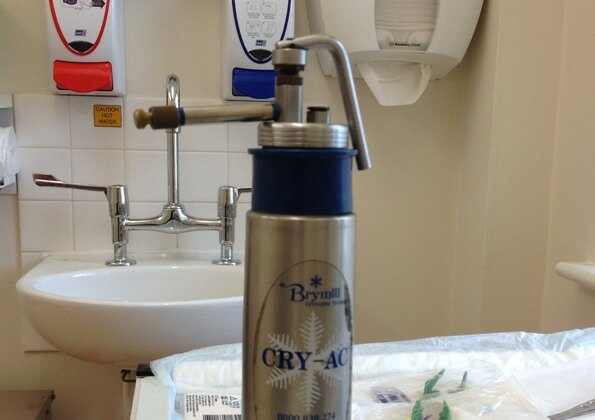 It is essential that cryotherapy is used for skin lesions where there is no doubt with the clinical diagnosis. Liquid nitrogen is the liquid state of gaseous nitrogen, which occupies 78% of the air we breathe. Liquid nitrogen is extremely cold, boiling at minus 196 degrees celcius. It is necessary to store and transport it in special flasks. Cryotherapy is done during the course of a routine out-patient consultation with your dermatologist, or by your general practitioner or their nurse, without any special preparation and is used mostly for the treatment of benign skin lesions such as viral warts.